Attaches to the fill end of the supply hose or pipe. A 6" air gap prevents siphoning back into a municipality's water supply, and cross contamination between tanks. The CCCD swivels, and an elevated section allows for tanks with hinged lids. T-bolts are included for tanks having flanged collars. 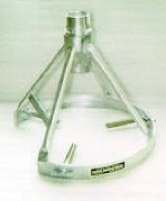 Built of light weight aluminum in 2", 3", and 4" sizes. 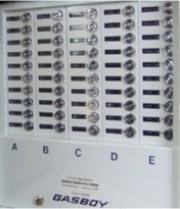 Controls are mounted in a 24" x 8" padlocking metal cabinet in either painted or stainless steel. The cabinet mounts on your existing poles or building, close to the delivery area for easy access. Available with Currency, Coin, and Bank Card acceptance in any combination. Flush-mount components are standard on all units. Available by special order. Each customer has his or her own special key and account. 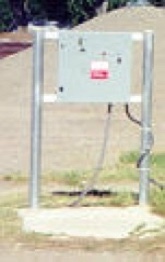 Water is metered by the gallon and the city reads individual meters on a billing cycle. Lock out for non-payment. Please call for more information. MFGR: Gasboy. One plane swivels allow the fill pipe to swing out of the way. Two planes allow the swivel to move any direction to accommodate different size trucks and tanks. Does not maintain position. Two of the most popular styles are shown. Various materials and sizes. Piping is not included. MFGR: OPW. Lead time: 2/4 weeks. 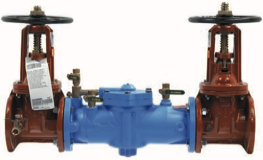 Reduced pressure zone provides protection to a municipal water supply as required by local codes. Does not provide protection between tanks. MFGR: Watts. Allows the fill pipe to rotate in any direction. A counterbalance maintains position while a truck is loaded. 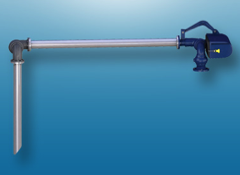 For even more flexibility, an additional swivel joint can be added to the end of the horizontal loading arm. Piping is not included. MFGR: OPW. Shown with flanged fittings & Style 40 Swivel at left. Credit and proprietary (prepaid) cards may be used. Minimum sale is $1.00. As with any bank card, transactions are subject to monthly charges and usage fees. Cell phone service, or ethernet connection is required. If your city already accepts credit cards, you may wish to use your current provider. Vernon Manufacturing is not involved in setting up your merchant service account, but the good people at Nayax are happy to help. Charges vary, so information is included with the installation packet to help you decide how to set up your account. Lead time: 2/4 weeks. acceptance. Mounting and installation by customer. This system and factory repairs are no longer available. Please call to discuss the latest upgrade.